In the first six months of life, infants are particularly prone to gastrointestinal (GI) signs and symptoms that have no obvious structural or biomechanical cause, but are thought to be due to changes in the infant’s GI system as it matures¹. Although not classified as organic disease, the disorders that can result from the developing GI tract can be extremely distressing for both the infant and concerned parents²`³. The collective term for these conditions is functional GI disorders¹. Functional GI disorders are highly prevalent during the early months, with around 50% of infants suffering from at least one functional GI disorder or related sign or symptom before six months of age⁴`⁵. 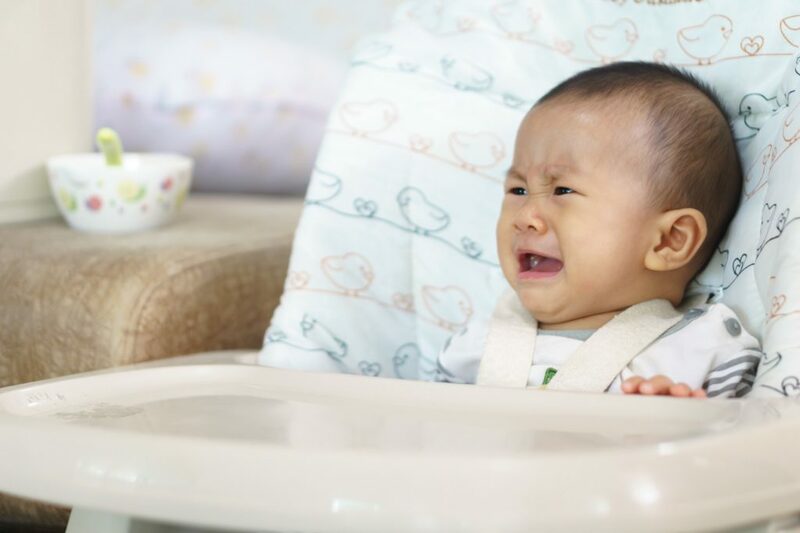 The most common functional GI disorders are infant reflux (affecting around 30% of infants), infantile colic (around 20% of infants) and functional constipation (around 15%)⁴. In addition to causing significant distress for infants and families, functional GI disorders also impose a considerable burden on the finances of concerned parents and overstretched healthcare systems, as discussed in ‘The health, wellbeing and financial impact of infant functional gastrointestinal disorders’. This is in part due to the fact that guidelines, which recommend parental reassurance and nutritional advice, are not always being followed, resulting in some infants being medicated unnecessarily and significant financial costs to the NHS⁶. Adhering to Rome criteria and NICE guidance can help to ensure optimal diagnosis and management of functional GI disorders. Before diagnosing a functional GI disorder it is necessary to exclude an organic cause for the symptoms. Red flag symptoms and differential diagnoses are listed in Table 1. Infants and children exhibiting these symptoms should be referred to an appropriate specialist. Internationally agreed criteria for the diagnosis of functional GI disorders, first published in Rome in 1989, have been regularly updated. The most recent version was published in 2016¹ (see Table 2). Guidance on the management of functional GI disorders from both NICE and ESPGHAN stresses that first-line management should be based around parental support and reassurance⁷`⁸`¹¹. The aim of patient reassurance is to alleviate parents’ concerns about their child’s health and to encourage a change in their behaviour, thoughts or understanding¹²`¹³. Approaches such as the Motivational Interviewing technique — a collaborative, goal-oriented style of communication — can help to ensure that parents are made to feel reassured and confident about the advice they have been given¹³. This approach involves skilled listening to the parents’ concerns and guiding their actions using expertise when necessary. • Evocation — to elicit the parent’s own perspectives and motivations. Effective use of these principles can help alleviate parental anxiety and discourage the use of inappropriate and expensive medication. The most important nutritional advice is to support breastfeeding mothers. Breastmilk is specifically tailored to an infant’s developing digestive system and may help to prevent the onset of some functional GI disorder symptoms⁸`⁹. Most guidelines agree that the first-line management of functional GI disorders should focus on parental reassurance and nutritional advice. Indeed, a recent review by Salvatore et al recommended that parental guidance should include advice on feeding volume, frequency, technique for all infants and “consideration of extensive protein hydrolysates or amino acid formulas with proven effect for formula-fed infants with persisting symptoms”¹⁰. Pharmacological intervention, whether prescribed or over-the-counter, is of limited use in functional GI disorders and should be reserved for only the most challenging cases¹⁰. Formula-fed infants who suffer from a functional GI disorder may benefit by switching from a standard formula to one specifically designed for the dietary management of the relevant disorder¹⁰. As reflux usually improves spontaneously within the first year of life, the main goal of management is to await this resolution while providing parental reassurance and symptom relief¹. According to NASPGHAN and ESPGHAN, formula-fed infants who fail to respond to non-pharmacological treatment may be suffering from milk protein sensitivity and should be considered for a two-to-four week trial of extensively hydrolysed protein-based (or amino-acid based) formula¹⁷. Pharmacological management is rarely required for infant reflux. NICE advises against the use of PPIs, histamine-2 receptors, metoclopramide, domperidone, or erythromycin, although alginates may be considered in infants showing marked distress if thickened feed has been unsuccessful⁹. NASPGHAN and ESPGHAN advise against chronic use of antacids/alginates in infants and state that proton pump inhibitors should be prescribed at the lowest dose possible and only when there is a clear diagnosis of gastro-oesophageal reflux disease (GORD)¹⁷. Effective management of colic usually focuses on helping parents cope with the challenge of dealing with a child who cries excessively. They may be relieved to learn that the crying will diminish, usually from around four to six months after birth¹⁸. If cows’ milk allergy is a potential cause: for breastfed infants, consider the exclusion of dairy products from the mother’s diet or extensively hydrolysed formula for formula-fed infants. If cows’ milk allergy is not a potential cause: provide support and encouragement for the mother to continue breastfeeding. For formula-fed infants; a partially hydrolysed, lactose-reduced or lactose-free formula. Comfort formulas, which contain partially hydrolysed proteins, are specifically designed for the dietary management of colic and constipation. Pharmacological therapy is not effective in infantile colic and may cause serious adverse reactions¹¹. Once an organic cause of constipation (such as Hirschsprung’s disease or cystic fibrosis) has been ruled out, management focuses on restoring a regular defecation pattern and preventing relapse. Parents should therefore be offered information on how often they should expect their child to defecate. Juices containing sorbitol, such as prune, pear and apple juice, can help constipation but are not advised as they risk an unbalanced nutrition and may lead to diarrhoea or abdominal pain. Pharmacological management includes the use of polyethylene glycol in infants over the age of six months¹¹. If this does not work or is not tolerated, NICE recommends the use of a stimulant laxative⁸. A closer look at the guidelines around the diagnosis and management of the most common functional gastrointestinal (GI) disorders: reflux and regurgitation, colic and constipation. Benninga MA et al. Childhood Functional Gastrointestinal Disorders: Neonate/ Toddler. Gastroenterology 2016;150:1443–1455.e2. Vandenplas Y et al. Prevalence and Health Outcomes of Functional Gastrointestinal Symptoms in Infants From Birth to 12 Months of Age. J Pediatr Gastroenterol Nutr 2015;61(5):531–7. Mahon J et al. The costs of functional gastrointestinal disorders and related signs and symptoms in infants: a systematic literature review and cost calculation for England. BMJ Open. 2017;7(11). National Institute for health and care excellence. Colic, infantile. reflux disease in children and young people: diagnosis and management. Salvatore S et al. Review shows that parental reassurance and nutritional advice help to optimise the management of functional gastrointestinal disorders in infants. Acta Paediatr 2018; doi: 10.1111/apa.14378. Vandenplas Y et al. Functional gastro-intestinal disorder algorithms focus on early recognition, parental reassurance and nutritional strategies. Acta Paediatr 2016;105(3):244–52. Linton, et al. Reassurance: Help or hinder in the treatment of pain. Pain 2008;134(1):5–8. Miller & Rollnick. Motivational Interviewing: Helping people change, Fifth edition. New York: Guildford Press, 2013. Bartick MC et al. Suboptimal breastfeeding in the United States: Maternal and pediatric health outcomes and costs. Matern Child Nutr 2017;13(1). Abrahamse E et al. Development of the Digestive System-Experimental Challenges and Approaches of Infant Lipid Digestion. Food Dig 2012;3(1– 3):63–77. Vandenplas Y et al. Pediatric gastroesophageal reflux clinical practice guidelines: joint recommendations of the North American Society for Pediatric Gastroenterology, Hepatology, and Nutrition (NASPGHAN) and the European Society for Pediatric Gastroenterology, Hepatology, and Nutrition (ESPGHAN). J Pediatr Gastroenterol Nutr 2009;49(4):498–547. Rosen R et al. Pediatric Gastroesophageal Reflux Clinical Practice Guidelines: Joint Recommendations of the North American Society for Pediatric Gastroenterology, Hepatology, and Nutrition (NASPGHAN) and the European Society for Pediatric Gastroenterology, Hepatology, and Nutrition (ESPGHAN). J Pediatr Gastroenterol Nutr 2018; [Epub ahead of print]. NHS choices. Colic. Available at: https://www.nhs.uk/conditions/colic/[Accessed May 2018].